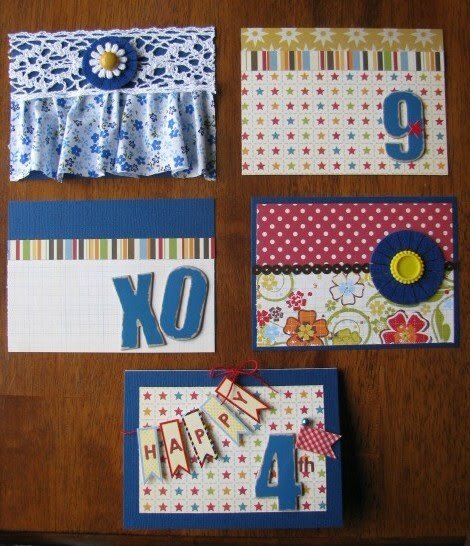 I fell in love with the color scheme for the February Polka Dot Whimsy main kit. I have a thing for bright, fun colors and find them so easy to use with photos I have of our boys. For some reason when I saw the stars, stripes, and polka dots in the kit, I thought of birthdays. I also loved using the Pink Paislee chipboard numbers on birthday pages. The boys love special breakfasts on their birthdays. 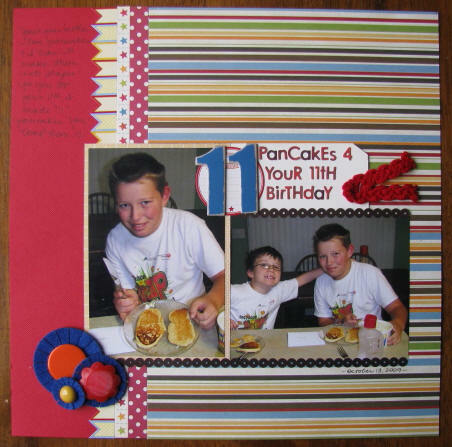 I "tried" to get creative and make "11" pancakes for Blake's birthday (in 2009!). I mixed the large "11" with the Basic Grey mini alphas in the kit to make a long title on a tag. To accent the page, I cut the Jenni Bowlin banner stickers to make a border down the page. Then I separated the layered felt flower by Epiphany Crafts to make three. I accented them with "doo-dahs" from the kit. There were some Studio Calico patterned papers in the kit that I wanted to use for school layouts. 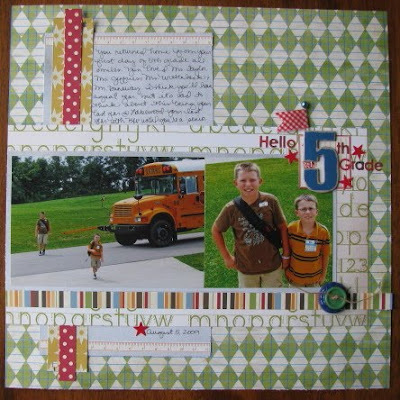 Since I wanted to stick with a 1-page layout, I pulled out these two photos of the boys returning home from the first day of school (in 2009...I'm a little behind...) Again I mixed up my title. LOVED adding the adorable handmade banner stick pin that Michelle made for us this month. I also really enjoyed mixing up the patterns from this kit. They were all so bright and fun! Finally, I did the unthinkable. I (yes, me...) made CARDS with my scraps. They were too pretty to toss and too few to make more layouts. I thought the one I made with the fabric looked a bit like a kitchen curtain! But, I still like it. It will make a great card for a friend. The other four just make me smile. Kevin gave the "9" card to a friend at a birthday party over the weekend. The "Happy 4th" card will go to my nephew on his birthday next month. ahhh more of those lovely chip board letters and numbers. This paper line is just too cute as well. I love how you used the banners on your cards and your page. Note to self try banners going down the page instead of across the page.